Who will get the last laugh?? 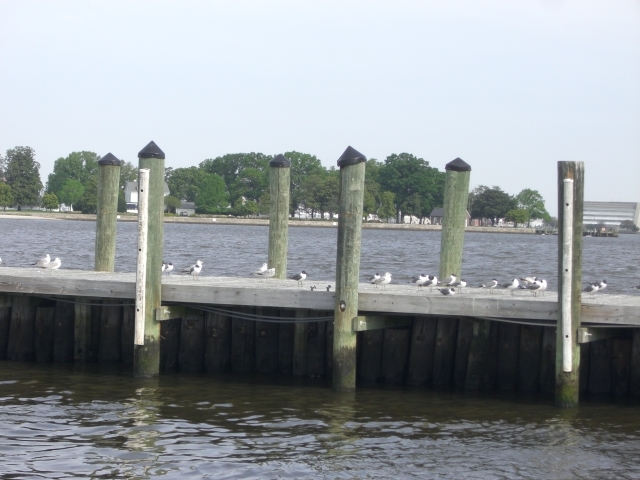 Could be the joke’s on us, but the dock we had for two days was about 60 feet away from Sea Gull dock, so named by me for the flock that called it home. I had ample time to observe what were mostly Laughing Gulls, go about their daily routine. We did take time out to walk the 1.2 miles to Food Lion, which took us through Old Towne, another historic area. Isn’t it great how the historic sections are so close to the waterfront? Laundry, baking and other boat chores managed to get done, but we did a fair amount of lounging about. The gulls had a set routine. When they weren’t laughing- and boy it was loud and raucous, they paraded around, males trying to impress females. Around mid-day they all, as if by prior agreement, left the dock and began a group water bob. Not sure the purpose for floating about in the water, but at least they were quiet. Later in the afternoon was a quiet time on the dock, but throughout the day not only did they laugh heartily, they mated. ‘Tis the season when a gull’s fancy turns to courtship. Brief, very brief. A few head to head nods and bobs, some beak rubs and forget the ring. What caught my attention was the change in tune; a distinctly different sound met my ears and well, I was looking out that way anyway. In addition to the Laughing Gulls, we had a seemingly endless song of sirens; fire, rescue and police. This was not the quiet marina I remembered from our stop in October. Oh, and the navy choppers flew over at least 4 times a day- low. When we weren’t spying on sea-gull behavior and lounging about, we (mostly Russ) checked the weather several times daily and planned our BIG trip. Thirty-six hours would take us from Norfolk (would move to an anchorage 13 miles closer) to Sandy Hook, NJ. The wind and waves needed to be right at both ends and Sunday looked like the day. Any special plans for Easter you might ask? Yep, hopping up the coast, the wind and waves at our stern and our sails filled as much as possible. Thursday afternoon we moved to Point Comfort, 13 miles closer to the Chesapeake and Cape Henry which we would pass to Port and swing north up along the Virginia, Maryland, Delaware and New Jersey coasts, before turning in at Sandy Hook Monday BEFORE sunset. I worked on the dinghy chaps that now look like something, but still need hemming and a few adjustments. We ordered a roll of light gray Textilene fabric to make sun shades for the sides and stern while at the dock this summer. The fabric is light weight and offers sun protection and some privacy. We’re talking rectangles here; my part for once will be easy. This entry was posted in Uncategorized and tagged salty sailor humor. Bookmark the permalink.